Turkish artillery fire on Wednesday killed four and injured six pro-Kurdish People's Protection Units (YPG) militants in the Ayn al-Arab area east of the Euphrates River in northern Syria, Turkish state-run Anadolu news agency said. 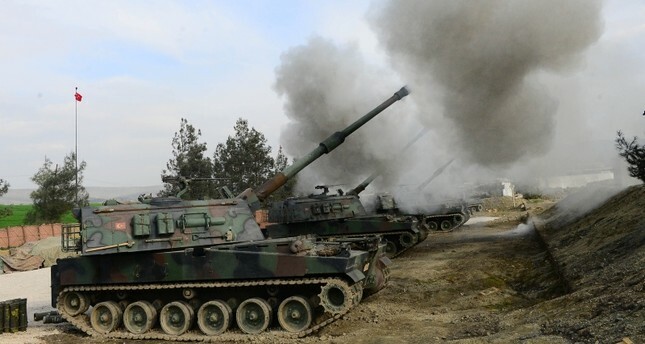 Turkish Armed Forces fired T-155 Fırtına howitzers from the Syrian border line in southeastern Turkey's Southeastern province of Şanlıurfa, the agency said. The shelling arrives after Turkish President Recep Tayyip Erdoğan on Tuesday said Turkey will soon begin a larger scale operation against terrorists in the east of Euphrates River in Syria. Turkey’s strongman stressed Ankara’s determination to conduct an anti-terror operation in northern Syria on the east of the Euphrates, saying preparations and plans for an offensive against the YPG, which Turkey maintains is an offshoot of the Kurdistan Workers’ Party (PKK), an armed group that has been in war in Turkey for over three decades, and designates a terrorist organisation. Turkish military shelled YPG positions in the Zor Magar area to the west of Ayn al-Arab region on Sunday. YPG forms the backbone of U.S. backed forces in Syria fighting against the Islamic State and controls almost all Syrian territory to the east of the Euphrates making up some one-third of Syria, as well as the towns of Manbij and Tabqah, on the west bank of the river.